For individuals who have ever planned a wedding or other event where the reception hall requires a cake cutting fee for every slice, chances are they never used this 100-year-old trick designed to cut cakes. This recently discovered cake-cutting method comes from a London-based author and mathematician. 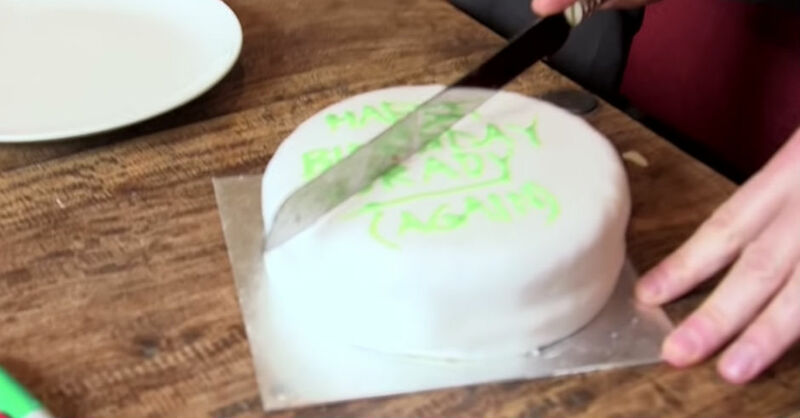 This 100-year-old method for cutting the cake is designed to prevent the cake from drying out. Most individuals cut the cake into wedges, providing every individual with a larger exterior piece and a point at the interior. However, with all of this surface area exposed, especially on the remaining cake, it leaves the cake exposed to additional air flow, which in turn can cause the cake to dried out. Instead, this cake cutting trick requires lines to be cut parallel to one another along the top of the cake. This way, the cake remains sealed and the moisture is not removed. For anyone who has had a cake out of the fridge the next day, they know the almost stale-like texture of the exposed cake area. With the slices cut across the cake, the thicker slices can be removed with a knife, while thinner slices can be removed by using a rubber band to glide into the slits and to pull the sliced cake up once the band becomes taught, allowing an individual to remove the cake slice from the interior of the cake. The remainder of the cake can then be pushed together in order to prevent any sort of air from touching the cake.